Brace Yourself For A Busy Fall! – PopTalk! Reestablish a good bedtime routine. Ease your children back into a busy schedule by gradually reintroducing a school year bedtime. It is helpful to start this process a couple of weeks before school begins so that your children are not thrown off balance with a drastic sleeping adjustment on the first day. The US Center for Disease Control and Prevention (CDC) recommends that children ages 1 to 3 get 12 to 14 hours of sleep, children 3 to 5 years of age, 11 to 13 hours, and children five to 10 years old, 10 to 11. This information is useful to keep in mind when reestablishing a bedtime routine. 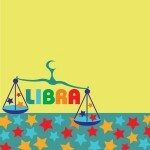 After all, a sufficient night’s sleep will greatly improve your children’s daily activities. 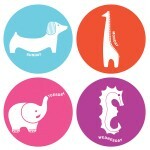 One of our adorable peel & stick clock decals can make keeping track of bedtime less of a chore! Life becomes much busier at the end of August or the start of September but that doesn’t mean it necessarily has to become more chaotic. With extracurricular activities, deadlines, meetings, social gatherings and more, keep the family up-to-date on the swirl of upcoming events by creating a calendar center, a centralized site for all family calendars and schedules. 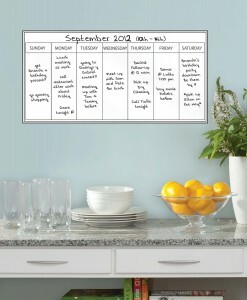 To ensure everyone is well-informed without overcrowding a calendar, assign each family member his or her own monthly dry erase board. 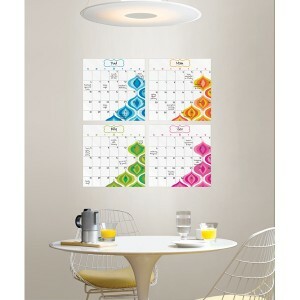 Ideal for this use, is the new WallPops by Jonathan Adler Bargello Wave Four-Piece Dry Erase Calendar set. The calendars feature Adler’s signature groovy waves in blue, orange, green and pink with one wave color per calendar so each family member can have his or her own. 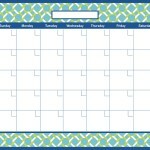 For other peppy prints, try the Links Monthly Calendar featuring white-and-green circular tie-knots over a teal background with a navy border along with the Honeycomb, a classic navy-and-white honeycomb pattern with a teal outline. Make the center complete with dry erase boards to leave extra notes and reminders to all. 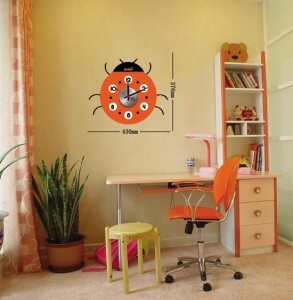 Try the coordinating Wave Dry Erase Board in a rainbow of colors with an orange outline. To add a touch of personalization, surprise the family with the cheerful collection of Zodiac Dry Erase Boards featuring a top, solid color to provide ample room for notes, divided by the astrological sign written in fun fonts and a festive pattern or design on the bottom of the board. Never underestimate how much planning ahead can improve each day. Before the week begins, plan meals for each day even stocking the freezer with prepared entrées for stress-free nights; layout children’s outfits a week ahead of time to save precious morning minutes as well as any other preparations to get you ahead of the game and ease the week ahead. As children can often get nervous for the big first day, initiate a new, fun tradition to mark the beginning of the school year and to begin autumn’s faster pace on the right foot. Simply spending time together can ease the transition and comfort nerves. Whether it’s a special family barbeque, end of summer vacation or big pancake breakfast the morning of, the tradition can be celebrated and looked forward to in the years to come. By following these tips and getting the new school year off to a good start, your family can have a seamless and joyful year.